This particular casserole is something I made to enjoy some rather special sausages that I was sent. Heck, a small independent sausage producer, pride themselves on a range of interesting and unusual sausages. Their zesty chicken sausages have around 50 calories each when cooked, are completely gluten free and are low fat. It’s a good start if you are planning a healthy dinner. So the calorie count for the dish is under 300 calories. 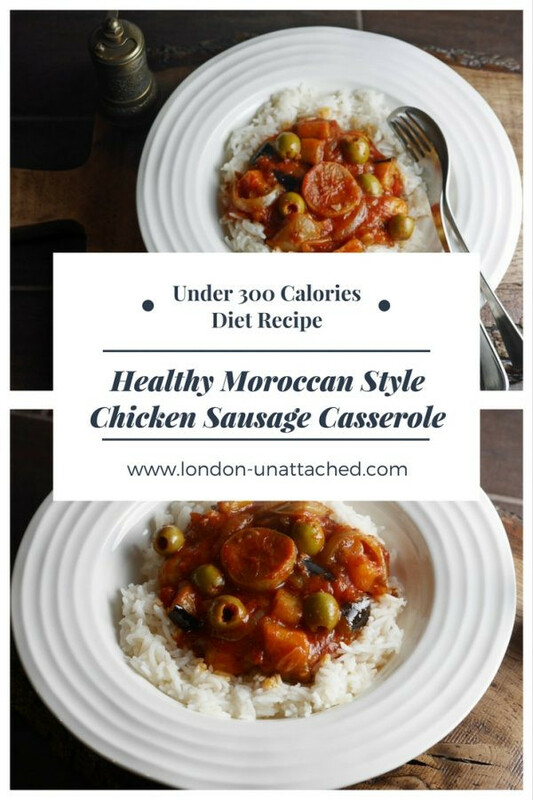 Served with a small portion of rice or couscous, you have a meal that should be around 300 calories per portion (with 2 sausages) but which still ticks all the boxes for a winter supper. It’s warming, filling and beautifully spicy. It also keeps well in the fridge for a day or so. It’s also in no way authentic, I’ve called it Moroccan style because of the harrissa, olives, aubergine and preserved lemons. 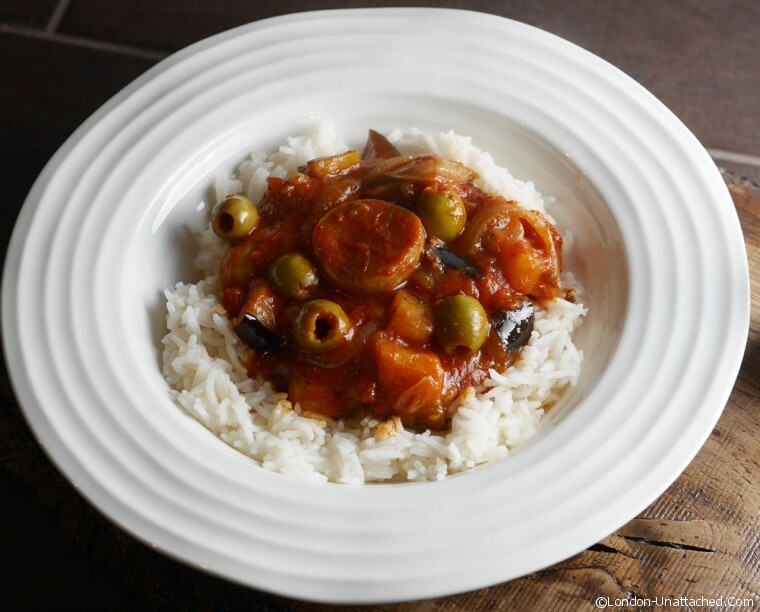 If you wanted to make this into a one pot dish, you could easily do so by halving some baby potatoes and adding them into the mixture at the same time as the tomato and olives. But, I rather liked the clean contrast of plain boiled rice here contrasting with the spicy sauce. 8 Heck Zesty Chicken Sausages You could substitute your own choice of spicy or zesty sausages here, just remember the pairing with lemon. I’m considering whether to restart the 5:2 diet in the New Year. Towards the end of 2015, I found myself eating out so much that any kind of diet just went out of the window. Generally, when I eat at home my diet is heavy on vegetables, fresh fish and homemade soups anyway, so I might simply modify my eating when I am out by option for fish or vegetarian options a little more. I’m looking for a sustainable way of living – one that is healthy and makes me feel good. Just a week of cooking for myself again has helped a lot – so perhaps I need to somehow translate that into how I eat when I am in a restaurant. Like the idea of this recipe? Why not pin the post for later! 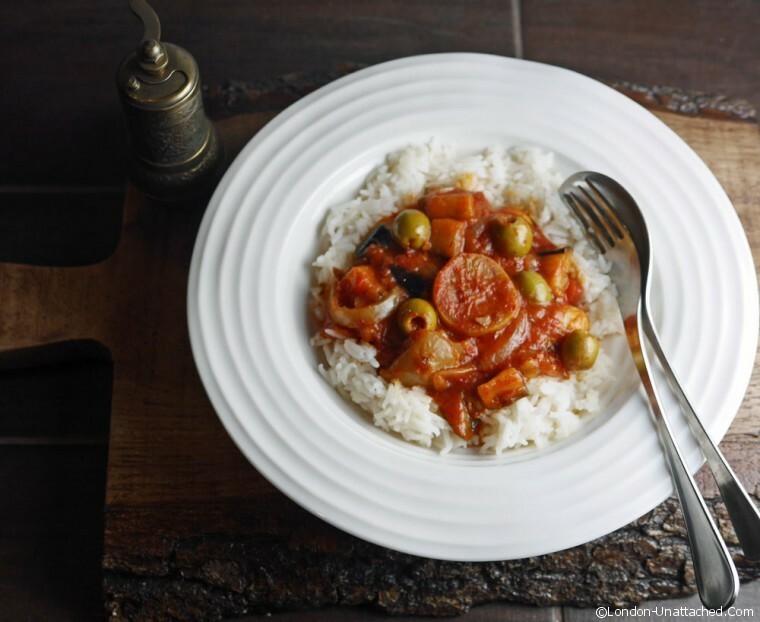 Yummy, we have had similar variations of this meal from Turkey to Portugal. So easy to do when our kitchen changes on a regular basis. I will try this one Fiona thanks for sharing.